I'm so glad you still had a good time! At least you still got to go! 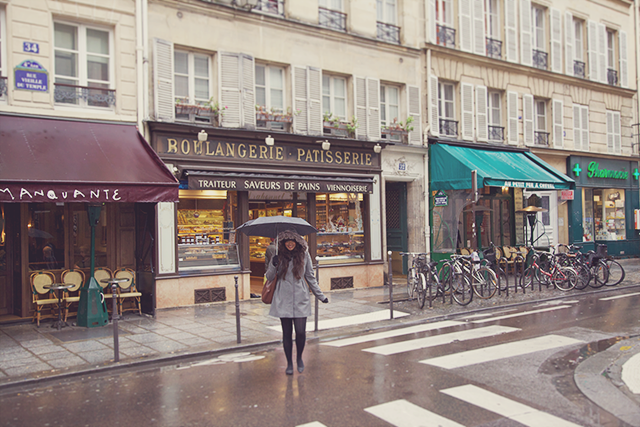 And even with the rain, those shops are so adorable! I love finding places where they look like that - there aren't really any where I live! i love that scene of 500 days. i have mixed feelings about that movie as a whole, but that scene in particular is perfection. I'm glad you still had a great time, despite the rain. I love that scene from the movie, it's the best part! At least the forecast wasn't wrong! When I went to Paris in early September, it was foretasted 70* and sunny. um, try 50* and rainy. It wasnt cold and wet the whole time, but I was pretty bummed (at first) and seriously un prepared!! Sending you some sunshine from Melbourne, but I am sure the weather will be perfect in Morocco! Have fun! That's one of my favourite scenes of that movie - I can identify with it so clearly! It's so awesome that you made the best of the rain and had such a great time. It's hard not to in Paris, I find. lovely photo and adventure. it's cliche, but very true, that things are how you make them. I wished my forecast warning has been wrong but..... the dreariness continues! Glad you had a good time despite the mess ! I was just watching "Midnight in Paris" last night and all the main character wants to do is stroll through Paris in the rain...but I imagine that's a lot rougher in winter! Oh, I love that movie scene! And Paris is special, even when it rains! I totally live by "hope for the best and expect the worst. I'm glad you still enjoyed yourselves despite the weather!